Seven years ago, Canadian Friends of Ukraine initiated a program to recognize the meritorious work of teachers in Ukrainian-language schools as well as educators who teach Ukrainian-language courses in schools where the principal language of instruction is not Ukrainian. The program focuses primarily on teachers from rural or small urban centres in eastern and southern Ukraine. The project is one of the few educational program's in Ukraine funded entirely by Canadian donors. In addition to monetary awards, all Honorees as well as the program's Canadian sponsors receive official Teachers' Awards Program Certificates in recognition of their outstanding contribution to education in Ukraine. The Teachers' Awards Program is carried out in six regions of Ukraine -- the provinces of Chernihiv, Sumy, Kharkiv, Donetsk, Luhansk as well as Crimea. Annual awards of $100 USD are granted to recipients whose names have been submitted for consideration by other teachers, school officials, parents, or local community organizations. The awards competition is advertised in local newspapers and through local non-governmental organizations. Award recipients are selected by a three-panel jury in each province. In addition to the monetary award, the recipients receive a Canadian Friends of Ukraine Certificate bearing the name of the award's Canadian sponsor. A Certificate of Recognition is also presented to each Canadian Award sponsor. The names of the Award Recipients in Ukraine are published in the oblast newspapers in which the teachers reside. Each year Canadian Friends of Ukraine bestow a minimum of 18 Teachers' Awards in six regions of Ukraine. A contribution of $150 dollars will fund one award and all related local expenses. Your support will enable the annual implementation of this important program. 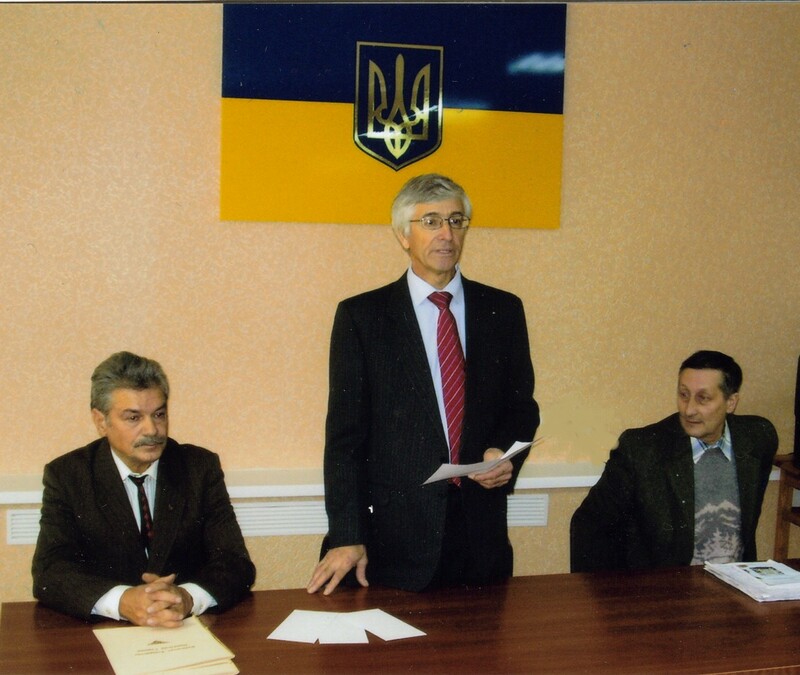 Members of the Teachers Awards Three-Panel Jury-- V. Kazban, M. Karpenko, and A. Blyzniuk-- announcing the names of the 2007 Teachers Awards Honorees in the province of Sumy. 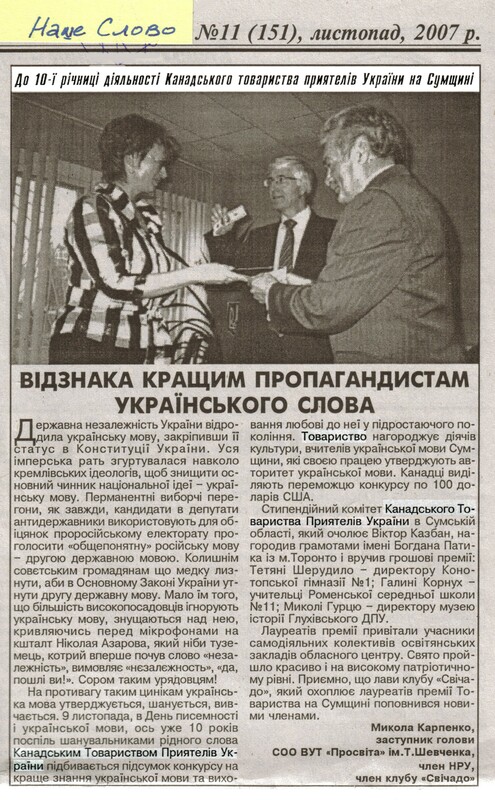 The Canadian Friends of Ukraine Teachers Awards Project was featured in the November, 2007 edition of Nashe Slovo (Our Word), a Ukrainian-language newspaper published in the province of Sumy. 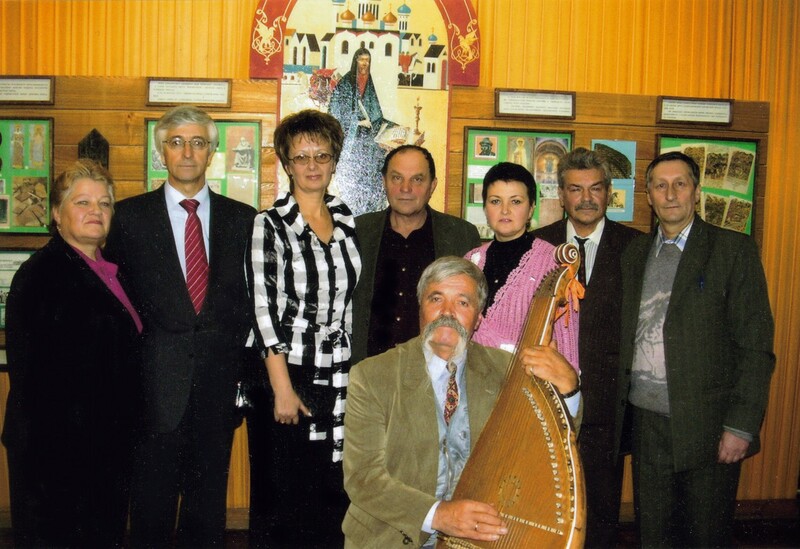 Kateryna Bilolubska, Chair of the Sumy Region NRU, poses with the 2007 Honorees,Tetiana Sherudylo (city of Konotop), Mykola Huretz (town of Hlukhiv), Halyna Kornukh (town of Romny), as well as the Members of the project's Selection Committee (M. Karpenko,Viktor Kazban, and A. Blyzniuk). They are joined by the Sumy region's acclaimed Kobzar virtuoso, Mykola Moshyk. Kateryna Solodovnyk, a 90-year old retired teacher, was an educator for over 42 years. She taught the Ukrainian language in the Bratenetska Elementary School in the Bohodukhiv region of Kharkiv province. She is pictured in her home receiving the CFU Teachers Award, presented to her by her former student, Yuri Ranyuk. Mr. Ranyuk, who has chaired the Teachers' Awards Project's selection committee in the province of Kharkiv since the program's inception in 2000, was amazed to learn that his former elementary-school teacher was still vital and active. Following the Awards Ceremony, an educator from the Donetsk region of Ukraine (on the left) poses with the Ukraine Coordinator of the Teachers Awards Program, Lida Madoyan (centre) and Liudmila Ohnieva (right), Chair of the project's Regional Selection Committee in Donetsk. Students from the city of Luhansk with their teacher (at right) Zinaida Harmash, a CFU Teachers' Award honoree in 2005, visiting the Uzhorod Monastery during a field trip to the town of Mukachevo. Teachers' Award Presentation ceremony in the city of Sumy honoring local teacher, O. Kravchenko. Participating in the presentation K. Bilomobska, (NRU Regional Head), Pavlo Movchan (Chairman of Ukraine's "Prosvita" educational association), Viktor Kazban, (Sumy regional coordinator of CFU's Teachers Awards Program), and Mykola Karpenko (Members of the Selection Committee).